Refrigerated boxes from Calabro Cheese revealed so many different sizes and shapes of Calabro’s premium quality and award-winning mozzarella and ricotta cheeses — some I have to admit I’m seeing for the first time. 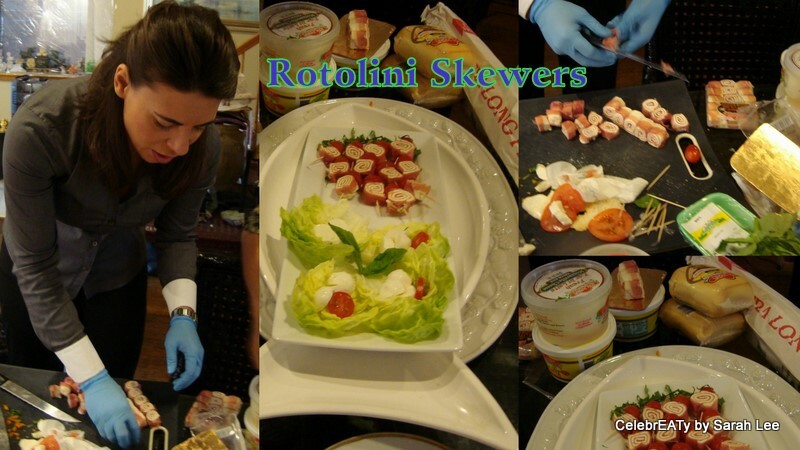 Mozzarella in blocks, fresh mozzarella balls comfortably bathing in seasoned liquids, Huge 3 lb Ricotta cheese, and best of ’em all, Rotolini or prosciutto-wrapped mozzarella. 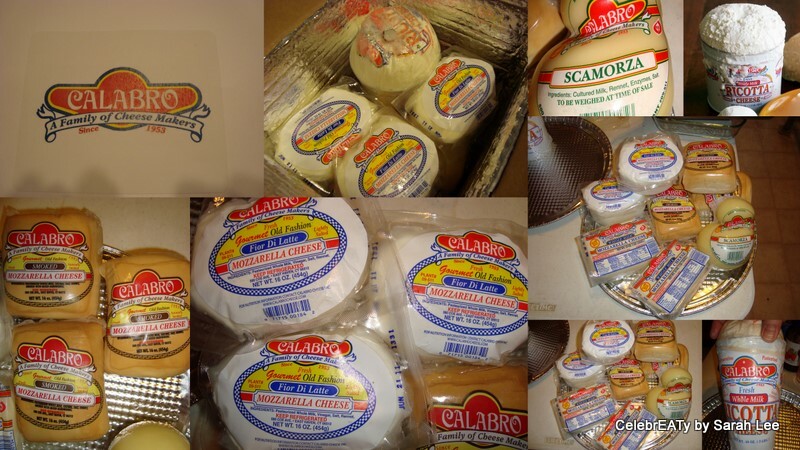 Refrigerator shelves filled up with Calabro cheeses…mmm, so what’s next? That was yesterday. Today’s the day, the day I’m having the Vice President of Sales of Calabro Cheese as my guest in the CelebrEATy Circle. Morena Febbo made it clear right away, “I’m Italian, and I’m expected to know how to cook.” And we all cheered. Yes, Morena’s in the house and the day’s evolving into some fun “cheesy” day, not as dark as it’s outside the studio. 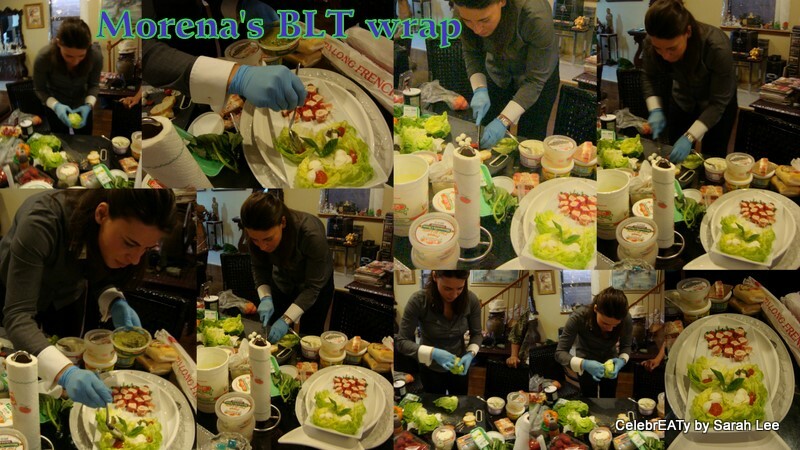 Morena wasted no time, asked for this and that, and emptied her groceries of fresh basil, fresh tomatoes, fresh berries, fresh lettuce, fresh (I meant not stale) French bread — yes everything’s fresh to go along with fresh, superior-tasting Calabro cheeses, the Ferraris of all cheeses. 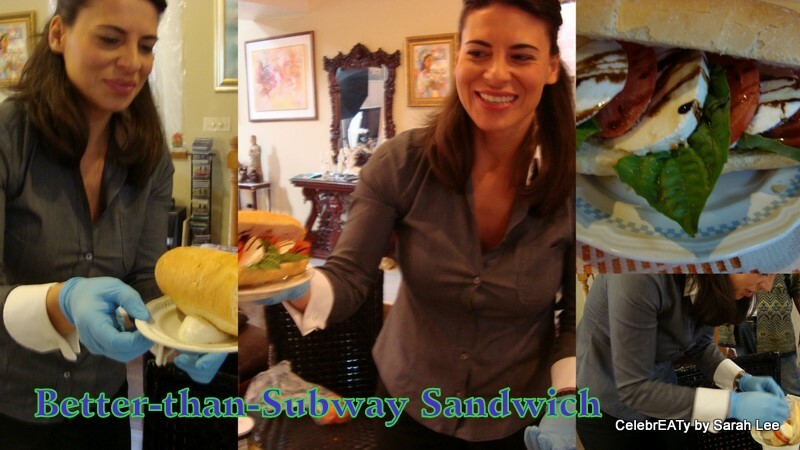 Morena then making sure Calabro Cheeses and cheese delights are “camera-ready” — I’m convinced Morena can cook…. Now, the big question is….Can she talk? Absolutely, she is the real deal, she is no doubt a “cheese monger” (who gave you this title Morena). It was a joy to have Morena on and off the camera. I think we did pretty good, no scripts at all, and no rehearsals too. (Calabro Cheese Corporation was founded in September 1953 by Joseph Calabro in Bridgeport, Connecticut. Mr. Calabro was born in Sicily, Italy in 1922, matriculated for three years at the University of Messina to attain his Ph.D. in Physics and Mathematics, served in the Italian army as an officer candidate, and emigrated with his sister and mother to the United States in October 1948. Five years later, Joseph, together with his father, Salvatore, began serving and delivering to the “mom and pop” stores, as well s the families of Fairfield and New Haven counties with fresh Ricotta, Mozzarella, and Sausage. In May 1958, Mr. Calabro joined with 50% ownership the Gambardella Cheese Corp. of New Haven, forming the Gambardella / Calabro Cheese Corp. As a result of growing sales and a larger area to boost their expanding line of products, the Gambardella / Calabro Cheese Corp. leased in November 1959, and in July 1961 acquired the Wells River Creamery Corp. of Wells River Vermont as a manufacturing plant, leaving the distribution in New Haven, CT. In January 1981, with sales at an all time high, Calabro Cheese built a new 24,000 square foot production and distributing center in East Haven, CT, and subsequently closing the Vermont and the New Haven facilities. In 1996, a 30,000 sq. ft. expansion project was completed, enabling Calabro Cheese to better serve it’s extended list of customers in the New England, New York / New Jersey metropolitan areas as well as the southern, midwest and western regions of the United States. Now the party has just begun…and I only have one name in mind when it comes to “everyday gourmet” cheeses….CALABRO CHEESE. 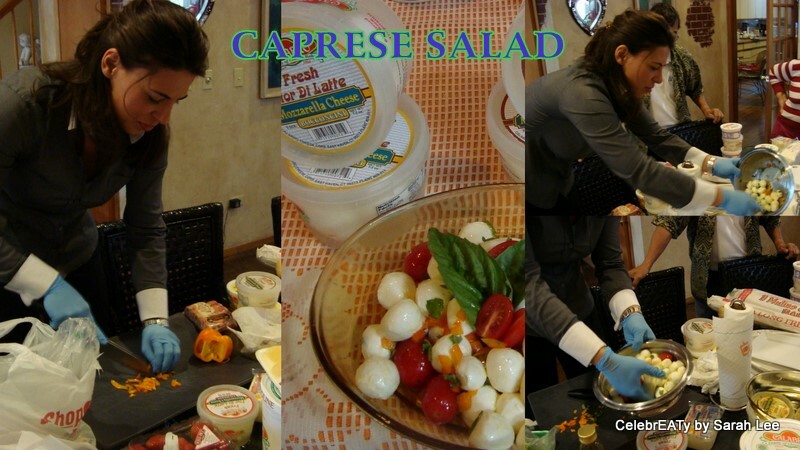 Thanks Morena Feebo of Calabro Cheese, yes, you really can cook and you’re Italian. I asked Morena some more “cheesy” questions and she obliged…. Q: As Vice President of Sales, what is a normal day in the office like for you? My time is spent traveling visiting with our customers (customer service is very important to us) promoting and selling all of our wonderful cheese. And curious if you would rather have lasagna or pizza on one of your “tough/stressful” days? Lasagna….why because its comfort food and brings back memories of mama in the kitchen on Sundays preparing delicious home cooked meals for the whole family. Comfort food is relaxing. Q: You must love working with food. So tell me how you got started or what attracted you to working in various food production facilities? 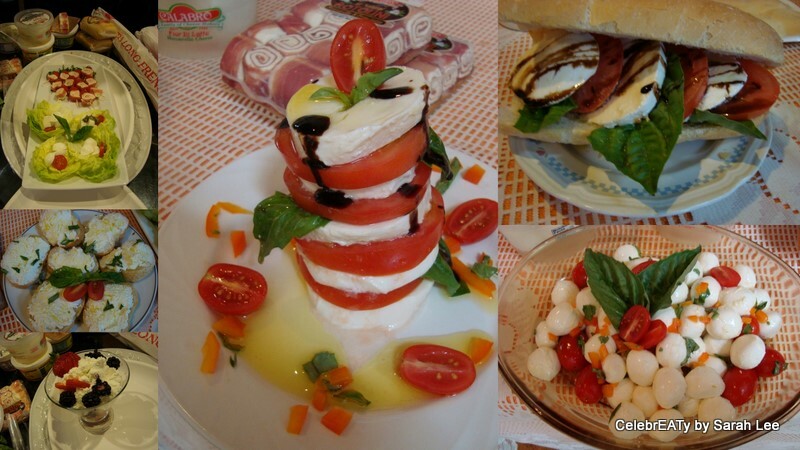 I’m Italian….by law we are required to love food!! 😉 I have been working with food for 20 years. I have worked for both food distributors and manufacturers… I am passionate about good food… both eating and preparing it. Q: Pizza being a full meal, I probably wouldn’t mind eating nothing but pizza for an entire week. Would you? YES! That’s the reason pizza is one of the Number 1 consumed foods in the country!! Its a communal food, you don’t need plates, napkins, or utensils… just grab and eat… it has all the food groups combined in one bite! Q: It just can’t be all pepperoni. So what are some of your favorite pizza toppings? Or tell me what’s your favorite way to top a pizza. My favorite is always Margherita, but also love anchovies! The beauty of pizza is that ANY topping you desire will work! Q: Pizza, they say, is all about the crust. So what’s your fancy — thin or thick crust pizzas? I know Chicago likes it thick….but I’m an east coast girl and thin crust is the way to go! Q: Tell me what to you is a really good pizza, I meant, Italian-style pizza. Or what to you is a really bad pizza? There is never any BAD pizza, just degrees of goodness!! Good pizza will have a crust that when held in your hand to bite does not flop over…. The sauce and cheese should be dolloped on so when you take a bite you can taste each ingredient. Q: Chicago is the home of deep-dish pizza (some considered this pizza to be “the beast”). Tell me some interesting variations you’ve tried with deep-dish pizza. Q: Leftover pizzas, do you have it reheated or you think it’s just great cold (my hubby loves cold pizza slices)? Cold …. Hot…. If the ingredients are fresh I enjoy both! Q: I have to assume you have mastered the art of making pizza crusts. How do you stretch the pizza dough to your pizza pan — or how do you rate yourself with pizza throwing into the air? Or do you have one extremely simple and really easy way to shape the pizza dough? Q: Okay, inexpensive blocks of mozzarella cheeses can be found in refrigerated section of leading supermarkets. But is it really that different using Calabro cheeses instead? Q: if there’s mold in unused mozzarella cheeses, would it still be ok to just cut away the moldy part and eat the rest of the cheese? Mold comes from mold spores in the air… there are many different kinds…they need moisture or heat to grow which is why its important to keep cheese properly refrigerated and sealed and when cutting into the cheese to make certain to use clean utensils… Mold can’t really hurt you but unless I know the source I can’t tell you whether you can eat it. Q: Most cheeses are gluten-free. Is Calabro mozzarella cheese gluten-free? Yes, but we have different formulations for our cheeses so if anyone does have a question they should call the company and confirm. 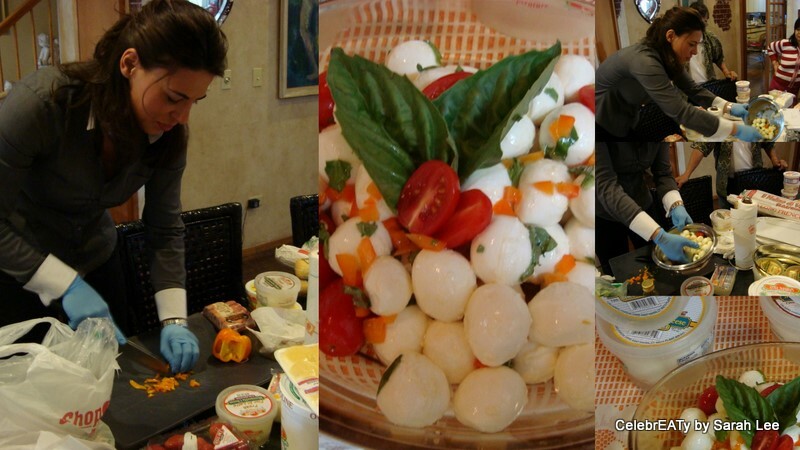 Q: What is the best way to firming up Calabro mozzarella cheeses for easy shredding or grating? Do you recommend freezing mozzarella first overnight? I never recommend freezing…there is moisture in mozzarella and by freezing, it will crystallize and the cheese will become grainy. Instead cold refrigeration should be fine to be able to shred. Q: Have you ever met a cheese you didn’t like or didn’t care at all? 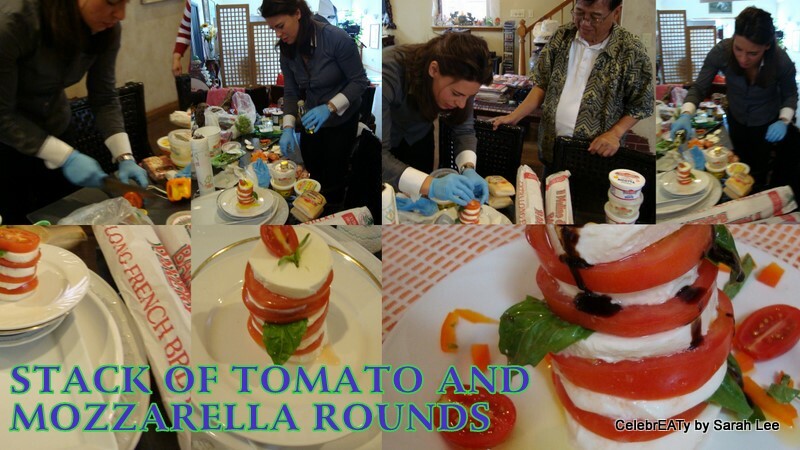 Q: Name some personal favorite recipes using Calabro cheeses. Q: Scamorza cheeses seem a bit unfamiliar in home cooking and baking. Would you label this cheese as the “other” mozzarella cheese? No, it’s a different cheese. It has its beginning as mozzarella, it’s semi soft, aged, different flavor, most underrated cheese that we make. Fabulous cheese… wonderful as a table cheese and for melting. Intense flavor. 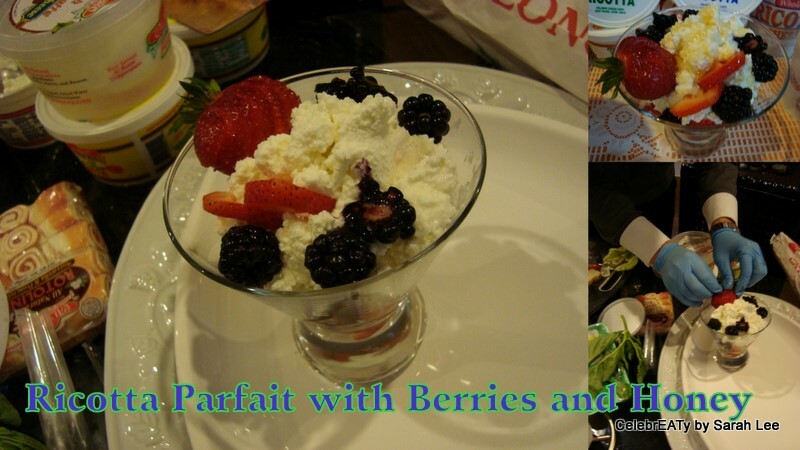 Q: Lastly, would you consider Calabro cheese gourmet or everyday cheese? This entry was posted in NEW (and also not so "new") TO THE "SHELVES" and tagged calabro cheese, gourmet cheese, morena febbo, mozzarella cheese, pizza cheese, ricotta cheese. Bookmark the permalink.